Form Description: It�s a little difficult to have a party without any guests. Creating a Party Guest List can help you determine not only who you want to come, but whether or not they will be coming at all. Simply fill out this form, and you will know exactly who you can expect to come to your part, as well as their contact information. A huge help for the busy party planner. Who ever said that your personal medical paperwork needs to be boring? Have a little fun with your paperwork by using this fancy version of the Party Guest List. It still allows you to maintain all of the important information that you need while also allowing you to have a bit of fun at the same time. 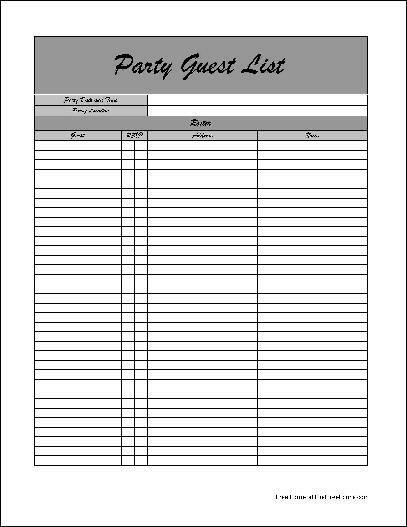 This form ("Fancy Party Guest List") is associated with the following keywords: General, party, guest, list, event, contacts, fancy.